A new one shot Star Trek publication “New Visions Special: Swarm” will be available from September, by John Byrne the writer and artist in chief. Twelve previous New Visions stories have been released in this photonovel season set during the era of Star Trek: The Original Series. The New Visions series uses authentic photographs from the TV episodes to create completely new stories, in the September’s edition “Swarm” the premise is that an alien civilization is the source of a dangerous new threat to the galaxy. The aliens with a million strong population are annihilating entire solar systems. As usual the only defense protecting the entire galaxy is Captain Kirk and the Star Ship enterprise, will they save the day? IDW who are publishing “Swarm” and the New Visions photonovels are also planning more Star Trek releases this year. 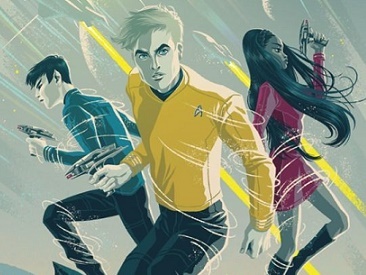 To celebrate the 50th anniversary IDW Publishing is introducing a new original Star Trek series in October, “Star Trek: Boldly Go”, which will follow chronologically immediately after the events of Star Trek Beyond (the most recent motion picture to hit the big screens). Writer Mike Johnson and artist Tony Shasteen, old hands at Star Trek comics, are the team behind the new season. “Star Trek: Boldly Go” will chronicle the lives of Kirk, Spock and the Enterprise crew as they explore new worlds and encounter both friendly and hostile alien species. Star Trek New Visions Special: Swarm will be in stores from September 7th. Star Trek: Boldly Go will be available in October.